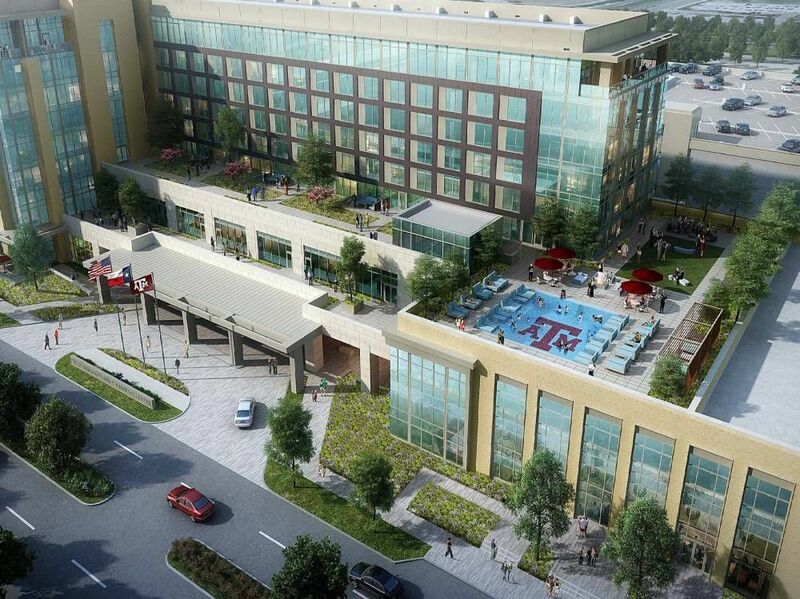 Texas A&M University announced plans for a new hotel and conference center located next to Kyle Field in the fall of 2015. Cain Parking Garage, the first phase of the project, opened in October 2016. The new buildings will open in September 2018. The idea for a hotel and conference center has been a conversation for several years, says Phillip Ray, vice chancellor of business affairs of the Texas A&M University Systems. As a rapidly growing institution, Texas A&M did not have the space to host the increased number of national and regional conferences it is pursuing, so the chancellor at the time put together a plan to build the conference center on campus, he says. From there, the chancellor and Ray discussed a public-private partnership to cover the cost of the project. The hotel was added to the plan to help pay off the cost of the project over time, and the parking garage satisfied the need for more on-campus, hotel, and conference center parking. Construction was at 40 percent complete as of July, according to Ray. The interior of the hotel will be similar to the style of the Founder’s Suites and the Legacy Club in the west side of Kyle Field. There is a model room in the Northeast corner of Kyle Field available for viewing beginning Aug. 1, says Ray. Curious minds cans get a glimpse of what a standard hotel room will look like. The hotel will have 250 units, to be comprised of 12 suites, a deluxe hospitality suite, and 237 guest rooms. Amenities such as a fitness center, full-service restaurant and bar, coffee shop, and retail, plus a ‘Grab & Go’ storefront, outdoor pool, outdoor event area, grand ballroom, and valet parking option will also be a part of the four-diamond quality hotel, says Ray. Texas A&M and their partners plan to auction off Guest Room Licenses in October. GRLs are similar to season tickets at Kyle Field and will likely have a license term of 10 years. Purchasers are buying the rights to a specific room in the hotel, according to Ray. GRL holders must provide advanced notice to reserve their room. While the decision regarding the amount of advance notice required has not been finalized yet, it will likely be in the two- to three-month range. If they do not make a reservation before the deadline, the room is available to the public. After the passing of the advance notice date, the GRL holder can still reserve the room, but they no longer have priority. Rates have not been set in stone, but Ray says the rates will be competitive. The conference center will be open to public and university use. “We hope to bring conferences we could not host before to College Station,” says Ray. There is also the potential for the smaller college career fairs to be hosted at the conference center. Once finished, the conference center will have 28,000 plus square feet of space for meetings and conventions. While the cost of the project is large, the public-private partnership with Stonehenge Holdings, LLC and National Campus and Community Development Corp. will enable NCCD to pay off the debt over time without spending any money from the Texas A&M University System. Operational profit will generate enough revenue to pay off the cost of the new hotel and conference center facilities, according to Ray. Once the debt is paid off, ownership of the facilities reverts to Texas A&M.